Daisy Dalrymple is an independent woman who earns her living as a freelance writer. Times are hard in the 1920s. Over 700,000 young men have been killed in the war with many others wounded in body and mind. As she takes on her freelance writing assignments around the country, she stumbles upon murder. This leads her to an association with Scotland Yard Detective Chief Inspector Alec Fletcher, who is destined to become her husband. He often has to caution her to not meddle in his cases, but Daisy has a mind of her own, a mind good at figuring things out. Even his superiors at Scotland Yard are terrified of her meddling in their cases. Daisy finds herself recuperating from bronchitis in a small country village where a friend from school now lives with two other women. Willie is the friend who is an accountant, Vera is a primary school teacher, and Izzie stays home and does the housekeeping. When Daisy and Alec are invited to Sunday lunch at the house the women have recently purchased, the locked cellar with no key to be found in mentioned. Alec picks the lock and is greeted by the stench of a long-dead body. Initially, this causes problems for the women as they need to move out of the house while the investigation proceeds and then they need to find someone who will clean the house. All the while they are under suspicion. The body is difficult to identify after several weeks in the cellar. Other suspects also present themselves, but all are eventually cleared leaving them to wonder who the culprit could be. Daisy, of course, figures it out first. A subplot reveals that one of the suspects has been embezzling money from his employer. Since Willie is doing the investigating, her secrecy with her work raises eyebrows with the police. Another subplot involved primary teacher Vera. She is nervous and upset especially when one of the other suspect’s names is mentioned. It turns out that the headmaster of the school where she teaches has attempted to sexually assault her. 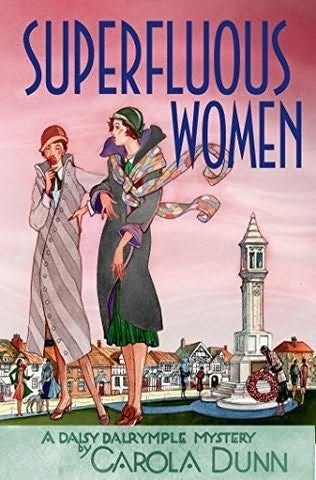 I enjoyed reading Superfluous Women by Carola Dunn for several reasons. First, I like mysteries, especially cozies, especially set in England, especially historical. All of these criteria were met in this book, Dunn’s 22nd in the series. Secondly, the mysteries are set in an interesting historical period. As mentioned earlier, 700,000 young men have been killed in the war. That leaves about 2 million women without the possibility of marrying and having a family as they were brought up to believe. Labeled “superfluous” or “surplus” by the press, they needed to create new lives for themselves. While women had not long had the vote, they were still constrained by the social mores of the time. Vera worries that she will be fired simply because she is associated with a murder (scandal). She also is afraid to report the assault to the police. They won’t/can’t so anything and it is only her word against the male headmaster. Willie is one of the first women who is an accountant around there, but many women must find ways to support themselves. Thirdly, we think of those killed and maimed in wars as being young men. But there is collateral damage to those left behind – the families and the young women who will not have a family since there are no young men to marry. And some men are physically fit, but bear scars from the war that cannot be seen. The damage from the war is visible in many of the characters. All in all, it’s an engaging mystery that gives the reader some other issues to ponder, too. I like your review style, Hokec. Very authentic :). Would love to feature your reviews in our weekly curated email digest that goes out to thousands of people.